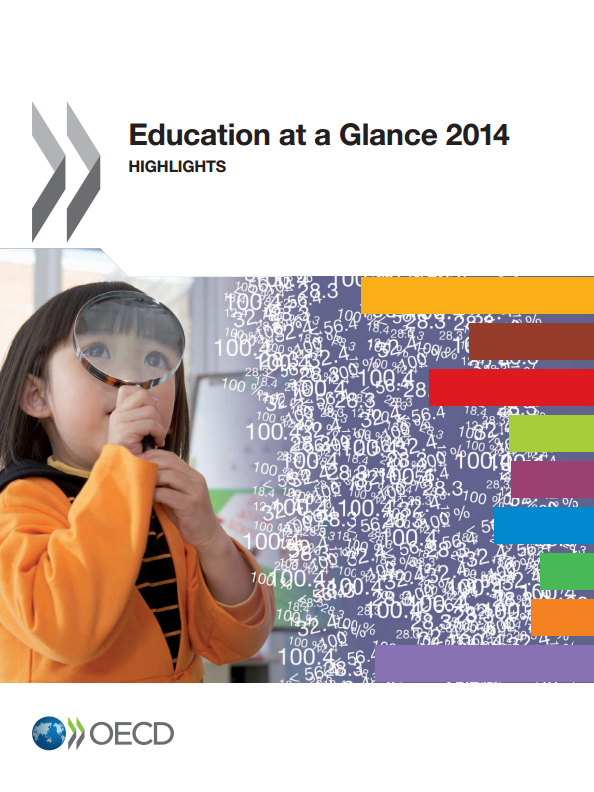 OECD Report: Success of global education reforms threatened by lack of oversight. Released January 19, 2015 – Governments around the world are under growing pressure to improve their education systems. Rising spending is increasingly being matched by reforms to help disadvantaged children, invest in teachers and improve vocational training. 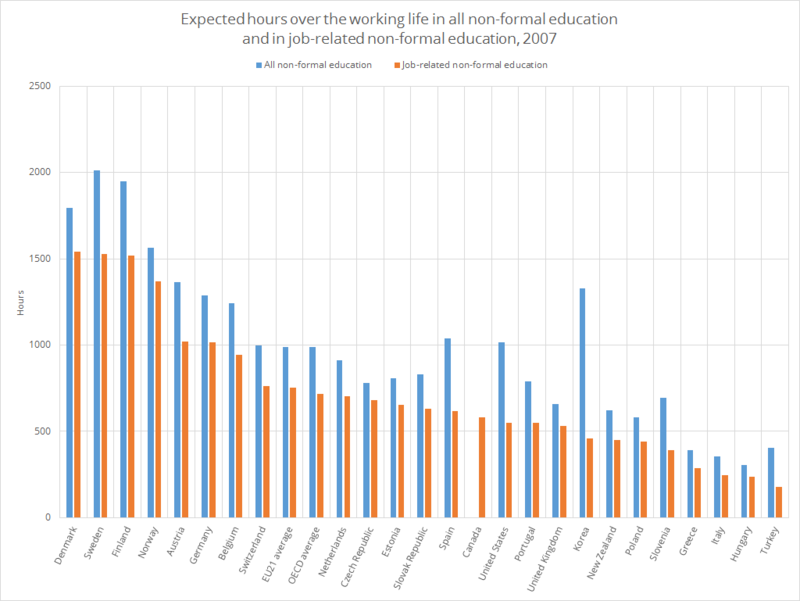 But a widespread lack of evaluation of the impact of these reforms could hinder their effectiveness and hurt educational outcomes, according to a new OECD report. Education Policy Outlook 2015: Making Reforms Happen finds that once new policies are adopted, there is little follow-up. Only around one in 10 of the 450 different reforms put in place between 2008 and 2014 were evaluated for their impact by governments between their launch and the publication of this report. Measuring policy impact more rigorously and consistently will prove more cost-effective in the long-run, says the OECD. It will also ensure that future reforms are built on policies proven to work over a timeframe independent of political cycles or pressures. The report finds a trend of reform priorities converging across the OECD. 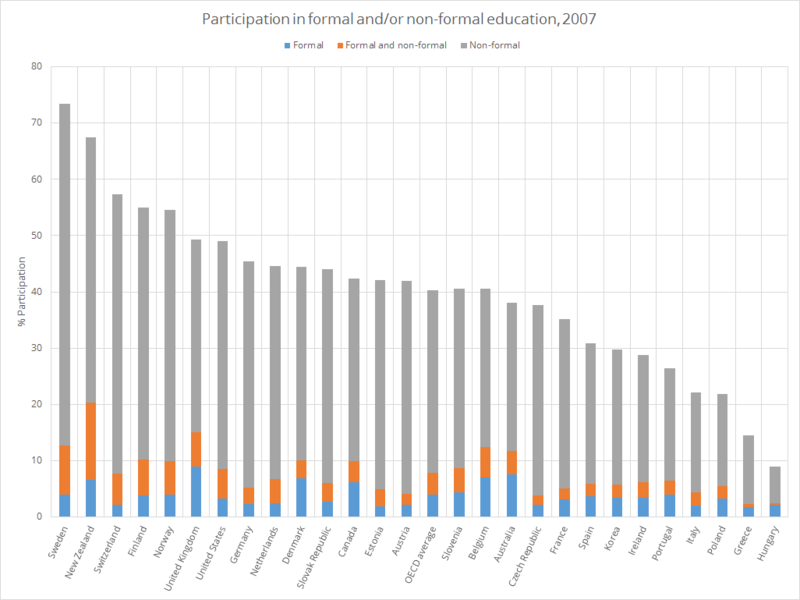 Of the reforms analyzed, most focused on: supporting disadvantaged children and early childhood care; reforming vocational education systems and building links with employers; improving training and professional development for teachers; and strengthening school evaluation and assessment. In preparing for a client engagement we assembled three required reads for our team. 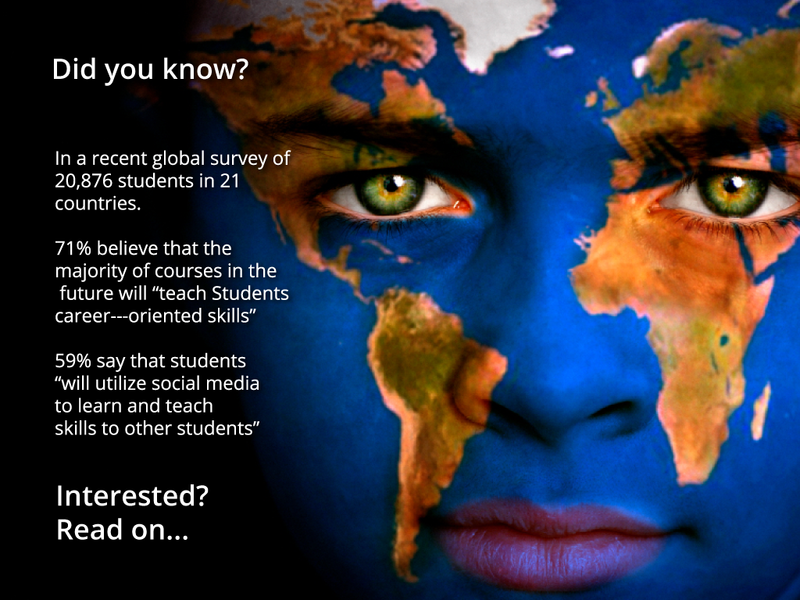 Our interest is in the future of higher education as it is evolving around the globe. We are also keenly interested in the policy backdrop that shapes a nation’s higher education system. That said this post provides a contemporary context by leading with Japan’s new Prime Minister Shinzo Abe’s efforts to strengthen the economic outlook through long term higher education initiative. It ends with a perspective from India commenting on Japans strategic position in higher education in Asia. Following the much-touted “Abenomics” floated by the administration of Japan’s new Prime Minister Shinzo Abe to revive the country’s stagnant economy, Tokyo last week unveiled “Abeducation” to promote the internationalisation of the country’s higher education. Abeducation, Abe’s growth strategy for education to develop human resources that can “prevail on the world stage”, is the latest official bid to reconstruct Japan. This is in line with new economic policies such as injecting new funds into the economy and other initiatives to resurrect Japan`s sagging clout in the world. “Abeducation aims to enhance the globalisation of our higher education institutions that have fallen in international university rankings. It is time to transform Japanese universities to world universities so they can be placed within the top ranking,” Minister of Education Hakubun Shimomura said at a press conference last Tuesday. Manash Pratim Gohain, The Times of India Jun 19, 2014. NEW DELHI: Japan continues it’s dominance in Asian higher education by holding the top position yet again in the Times Higher Education Asia University Rankings 2014, released a few hours ago on Thursday. The country has 20 representatives in the Top 100 table. But breathing down its neck is mainland China, which made significant stride registering 18 of its universities in the list, an increase of three since last rankings. Look for more Future of Higher Education synopsis posted here. 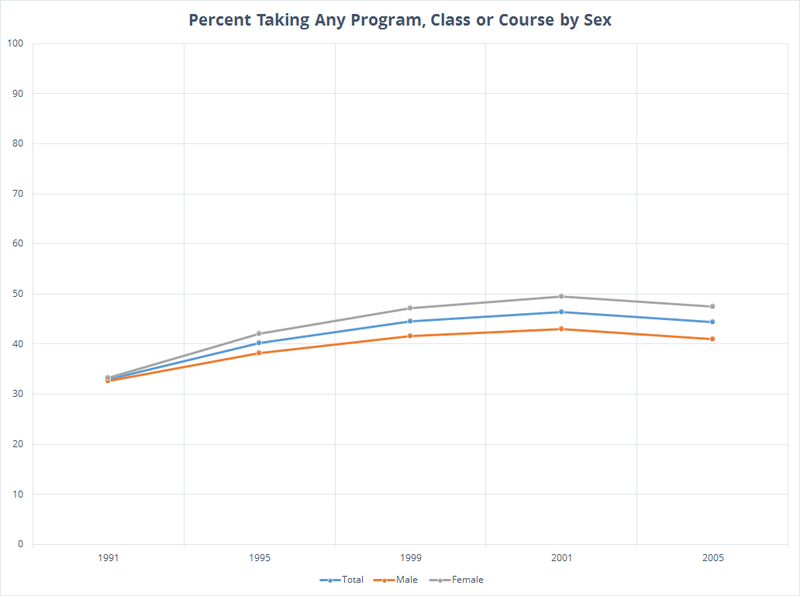 Guest Blog posts on the outlook or future of higher education are welcome. 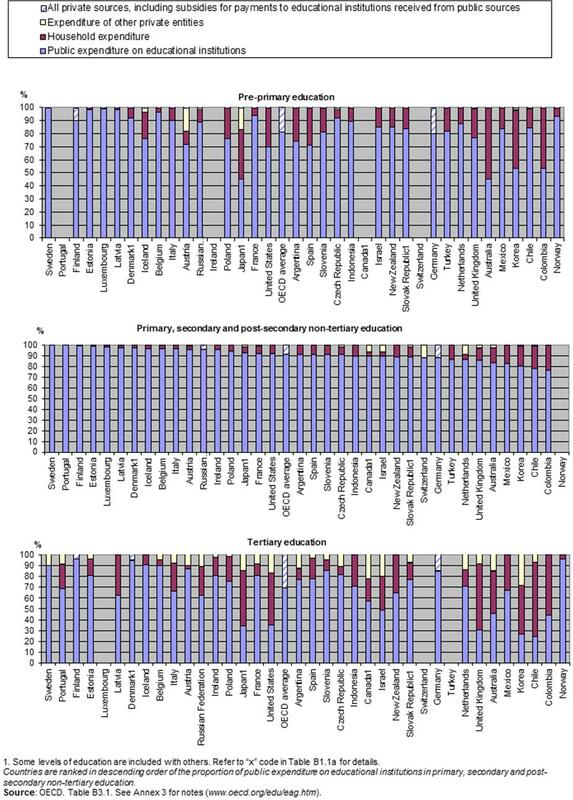 OECD released their annual data report September 9, 2014. It is the leading international compendium of comparable national statistics measuring the state of education worldwide. 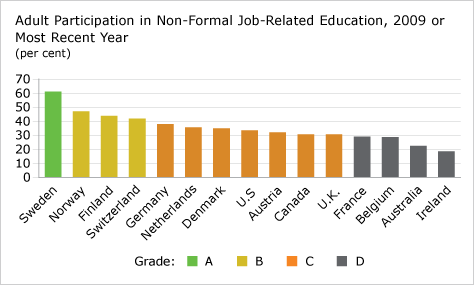 This year’s report includes new indicators that provide further evidence of the critical role that education and skills play in fostering social progress. 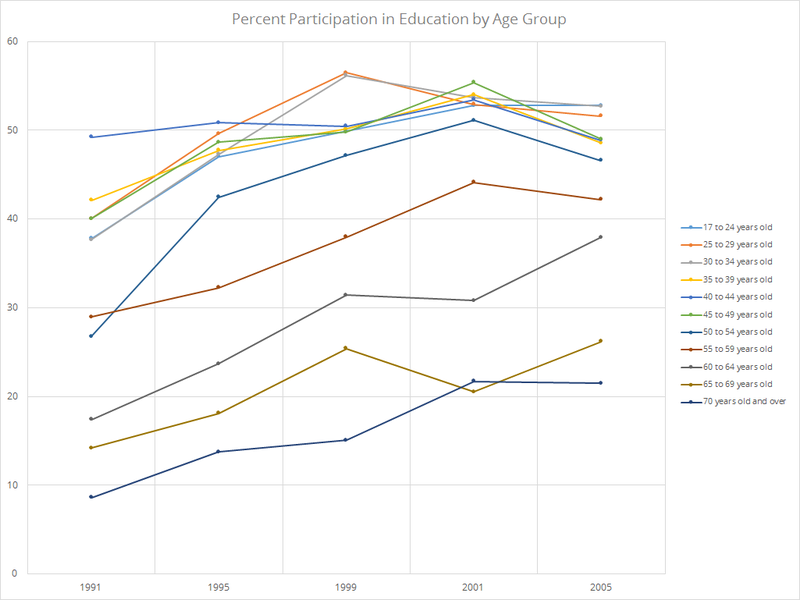 These include the links between education levels and employment; educational attainment and social mobility; and trend data and analysis for all the key indicators. The report also addresses: public and private spending on education; its social and economic benefits for people and economies; tuition fees; the outcomes of education based on an analysis of tertiary completion rates; and class sizes, teacher salaries and instruction times. The Organization for Economic Cooperation and Development (OECD) is a unique forum where the governments of 34 democracies with market economies work with each other, as well as with more than 70 non-member economies to promote economic growth, prosperity, and sustainable development. OECD member countries account for 59 percent of world GDP, three-quarters of world trade, 95 percent of world official development assistance, over half of the world’s energy consumption, and 18 percent of the world’s population. Together with its sister agencies, the International Energy Agency (IEA) and Nuclear Energy Agency (NEA), the OECD helps countries – both members and non-members – reap the benefits and confront the challenges of a global economy by promoting economic growth, free markets, efficient use of resources, and energy security. 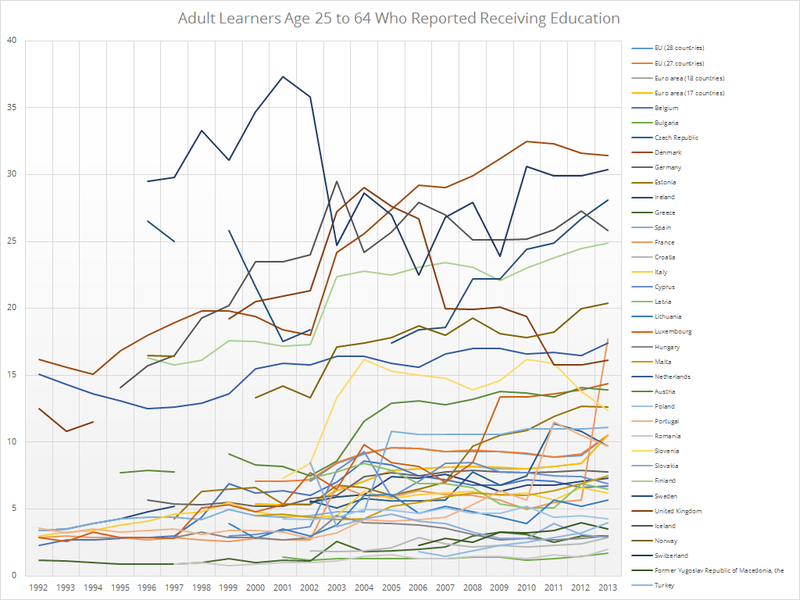 International Students in Contemporary Context Insight from the U.K. The British public do not see international students as “immigrants” and are opposed to reducing the number coming here, even if this would make it harder to reduce immigration numbers, according to new research released today by Universities UK and think-tank British Future. The government should instead remove international students from the net migration target and support and challenge universities to attract more international students to study here, the report argues. The new research poses a challenge to the government as it seeks to keep its promise to reduce net migration to “tens of thousands”. International students are the largest group of migrants from outside the EU counted in the government’s net migration figures, representing around a third of all people coming into Britain. 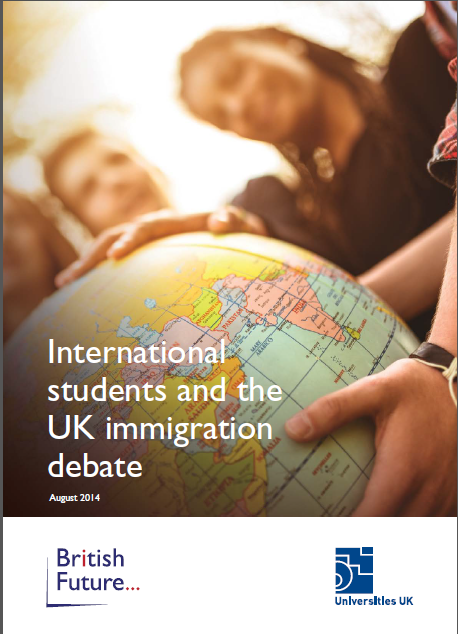 Yet only a fifth (22%) of people think of international students as “immigrants” at all. When people are told that students are part of the target, “the most common reaction is surprise and even bafflement that international students are classified as immigrants at all,” the report says. New ICM polling conducted for the organisations finds that targeting international students would be unpopular and would fail to address public concerns about immigration. Six out of ten (59%) people say the government should not reduce the number of international students, even if this makes it harder to reduce immigration numbers. Only 22 per cent would support a reduction in international student numbers. Among Conservative voters, the figure was even higher, with two-thirds (66%) of Tories opposed to a reduction in international student numbers, compared to just 23 per cent who would reduce international student numbers so as to get immigration numbers down. The majority of people (75%) are in favour of allowing international students to stay on and work after they finish their degree. Support rises to 81% for Conservative voters. Sixty per cent think international students bring money into the local economy, compared to only 12 per cent who think they are a net drain on the local economy. Support rises to two-thirds (66%) of people living in university towns and nearly three quarters (72%) of Conservative voters. Sixty-one per cent agree that Britain’s universities would have less funding to invest in top-quality facilities and teaching without the higher fees paid by international students. Only seven per cent disagree. Laureate International Universities is the world’s largest network of higher education institutions with 75 members located in 29 countries and enrolling more than 850,000 students worldwide. In an effort to look forward and develop a vision for the future of their members over the next 15 years they commissioned a large scale survey of their students. 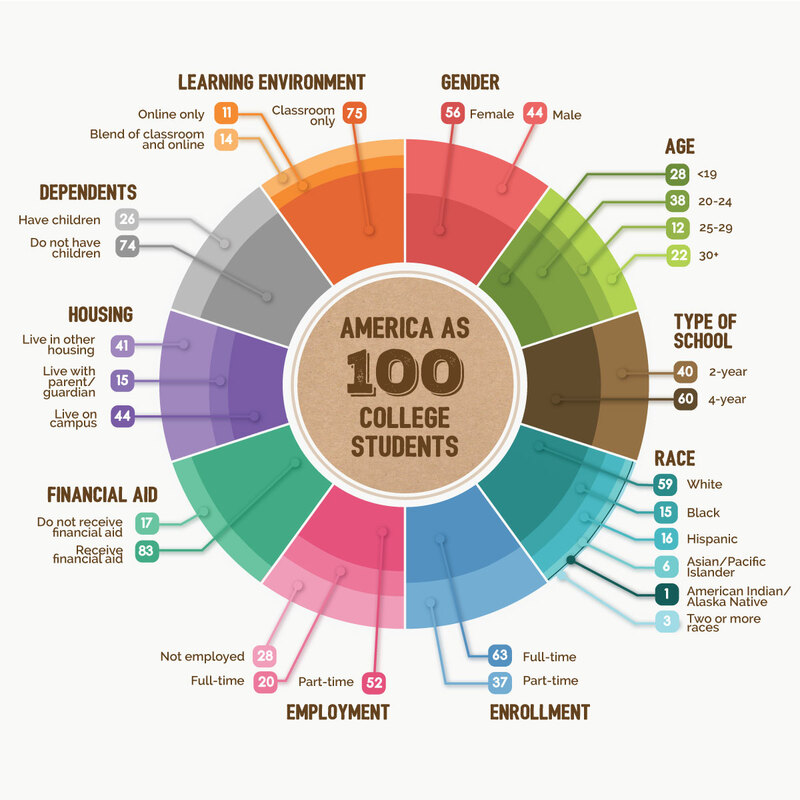 They commissioned Zogby Analytics to survey their students and 20,876 learners responded. The survey asked students about their vision of the optimum university model 15 years in the future. This is a must read. The study can be retrieved here. An interview with John Zogby, Pollster and Founder, Zogby Analytics; Jonathan Zogby, President and CEO, Zogby Analytics; and Doug Becker, Chairman and CEO, Laureate Education, Inc. (Washington, DC June 9, 2014). Michael G. Dolence and Associates partnered with the architectural firm of Perkins and Will as academic planning and prototyping consultant for the design and phased construction of the new campus. A comprehensive curriculum was constructed and a 50 year prototype developed permitting the exploration of multiple scenarios to inform project design and implementation. Michael G. Dolence and Associates teamed with the architectural firm of Perkins+Will as academic planning and prototyping consultant for the design of the 3.2 million-square-foot, 2,000 acre campus. The prototype drew upon a comprehensive course and program repository assembled within the MGD+A proprietary academic planning system. Over 800 curricula informed the development of 1,476 courses to support 52 programs of study to guide the University’s language institute, eight colleges, and six schools within the College of Health. 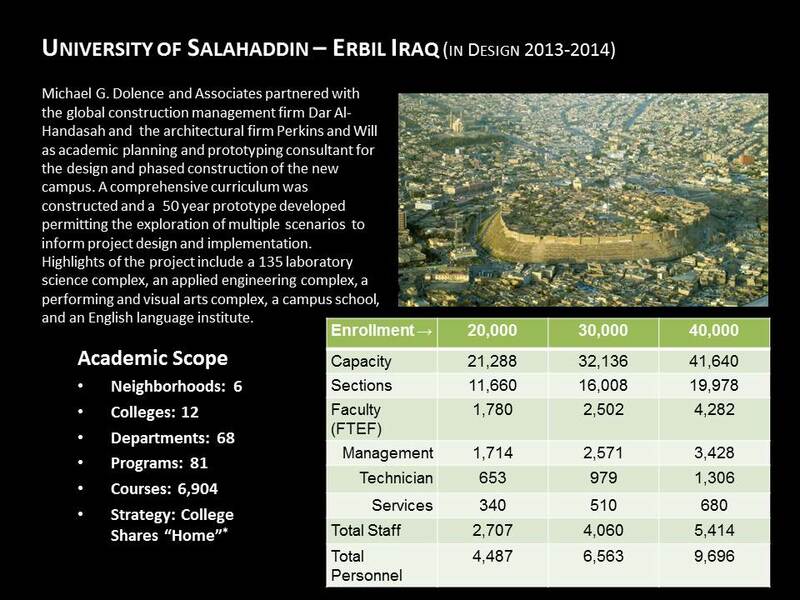 The prototype identified specific design criteria for the physical facilities required to teach each program of study. The prototyping process resulted in a design that accommodates 42,000 students in minimum curriculum architecture format and over 70,000 using an optimized curriculum architecture. The University currently enrolls more than 60,000 students. View the Perkins+Will Image Gallery for this project. View project photographer Bill Lyons Photo Gallery. 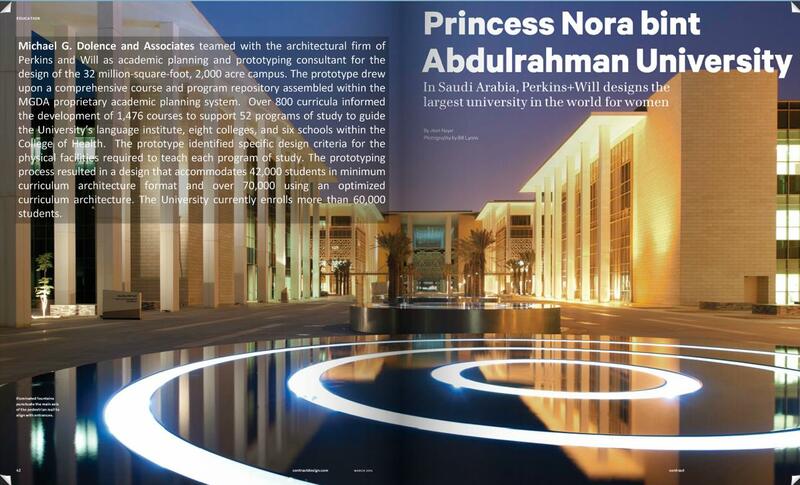 View the full article in Contract Magazine – March 2014, page 42. 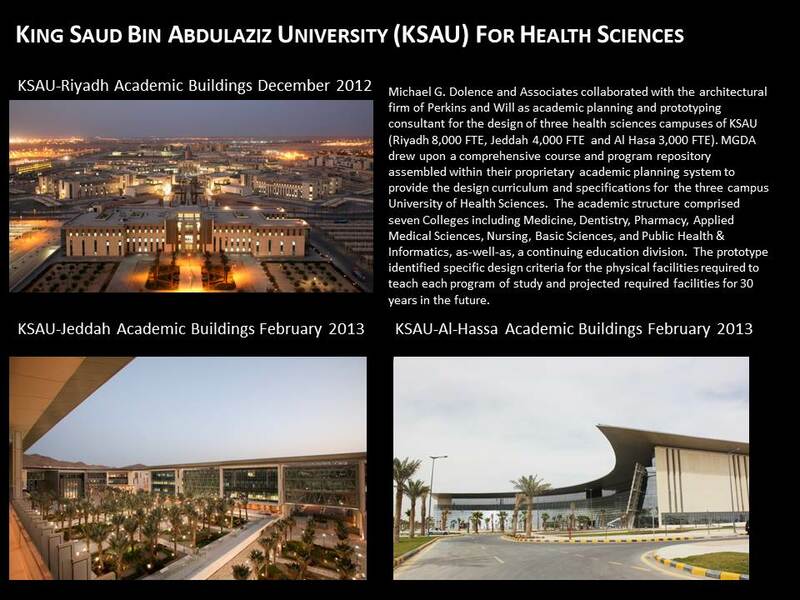 Michael G. Dolence and Associates collaborated with the architectural firm of Perkins+Will as academic planning and prototyping consultant for the design of three health sciences campuses of KSAU (Riyadh 8,000 FTE, Jeddah 4,000 FTE and Al Hasa 3,000 FTE). MGD+A drew upon a comprehensive course and program repository assembled within their proprietary academic planning system to provide the design curriculum and specifications for the three campus University of Health Sciences. The academic structure comprised seven Colleges including Medicine, Dentistry, Pharmacy, Applied Medical Sciences, Nursing, Basic Sciences, and Public Health & Informatics, as-well-as, a continuing education division. The prototype identified specific design criteria for the physical facilities required to teach each program of study and projected required facilities for 30 years in the future. 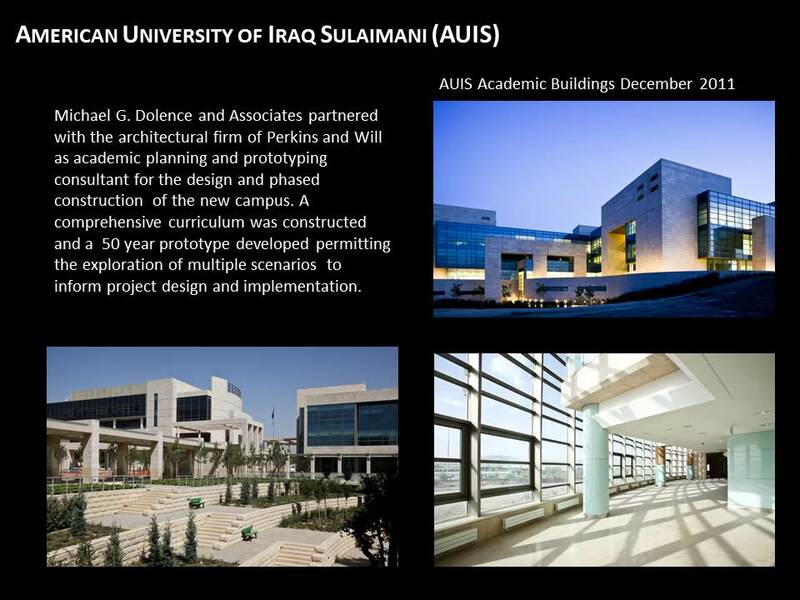 Michael G. Dolence and Associates partnered with the global construction management firm Dar Al-Handasah and the architectural firm Perkins and Will as academic planning and prototyping consultant for the design and phased construction of the new campus. A comprehensive curriculum was constructed and a 50 year prototype developed permitting the exploration of multiple scenarios to inform project design and implementation. Highlights of the project include a 135 laboratory science complex, an applied engineering complex, a performing and visual arts complex, a campus school, and an English language institute.